This article was written with the input of Anastasia Tzeveleka and Ken Hsu, Solution Architects at Alexa. Today we are excited to announce our new beta testing tool for Alexa skills which makes it easy for you to get beta feedback on your skill. You can now invite users to test your Alexa skill and provide feedback before you publish your skill. By introducing real user feedback into your development process, you can build more intuitive voice experiences. We recommend you ask users to beta test your skill, gather any feedback, then optimize your skill’s voice experience before submitting your skill for certification. Check out our documentation to learn more about the skills beta testing tool. Mobiquity Inc. already uses this tool to great effect, says Jonathan Patrizio, Evangelist and Technical Advisor at the professional services firm. "Before we publish an Alexa skill, we carry out at least two cycles of user testing with the tool. It makes it easy to manage the overall process of user testing, to initiate tests, communicate with users, and gather feedback from users. It’s very simple to use," says Patrizio. 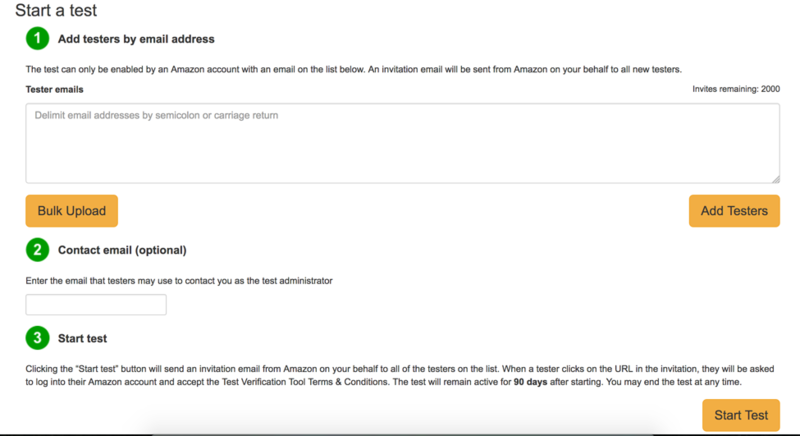 To get started with the skills beta testing tool, simply sign into your Amazon developer account and follow the steps below to run your own private or public beta tests. 1. Click Alexa on the menu navigation bar at the top. Then click "Get Started” for the Alexa Skills Kit. 2. Click on the name of the skill you would like to beta test. You will see the “Skills Beta Testing” panel listed on the left. If you don’t see the prompt to start beta testing your Alexa skill, be sure you are listed as an admin or developer. Ensure the skill metadata tabs with the skills information, interaction model, configuration, test, publishing information, and privacy and compliance are all complete. 3. Click on “Beta Test Your Skill” to set up a new test. The Skill Beta Testing page will open in a new tab. You can see the test status at the top (NOT STARTED, ACTIVE, COMPLETE). 4. To invite your beta testers, enter their email address in the Tester email field manually or upload a file with their email addresses using the Bulk Upload option. The current supported formats are semicolon-separated and new-line-separated. Once you have entered all email addresses, click on "Add Testers" to update the testers in the system. Note that you need to click "Add Testers" each time you want to make a change to the beta tester list. 5. Enter an email address in the "Contact" email field so testers can contact you. 6. You are all set! Click on "Start Test" to start your beta testing. This will send out an invitation email to your beta testers with a link to enable the skill. And you will be taken to the Beta Testing Service dashboard. 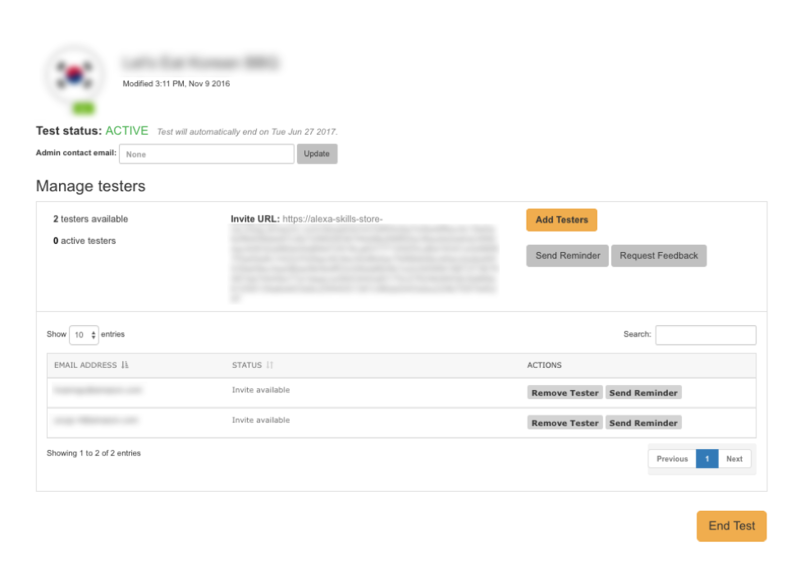 You can manage your beta tests at any time via the dashboard. Simply navigate to your skill and click “Manage Test Skills” in the “Skills Beta Testing” panel to open the Beta Testing Service dashboard. You can also end your test from within the dashboard at any time by clicking "End Test." You will see a notification that says this will end testing and all testers will be notified. Click "OK" to end the test. After a beta test is complete, you can analyze results or even start a new beta if needed. “The skills beta testing tool is a key component to our overarching testing strategy and helps ensure we are building quality conversational skills," says Patrizio of Mobiquity. 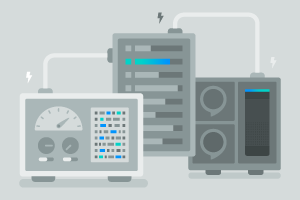 Improve the quality of your Alexa skill by leveraging the new skills beta testing tool. By optimizing your skill for your users, you can build a more engaging experience for users. Learn more about the skills beta testing tool in our documentation.